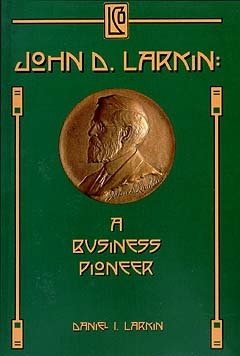 John D. Larkin, a native of Buffalo, New York, was a pioneer in American business. The soap manufactory which he started in a rented building in 1875 grew to become one of the largest mail order houses in the country by the turn of the century. As a teenager, Larkin had learned the soap business from the ground up, working for his brother-in-law making soap in Buffalo, and slinging soap (selling door to door) in New York City and Brooklyn. Using innovative marketing techniques, Larkin Company grew to become a rival of such giants as Sears Roebuck and Montgomery Ward. His grandson, Daniel I. Larkin, tells the story that is nothing less than the American dream. A trail-blazer rises from humble beginnings to become head of a firm whose name was a household word from coast to coast.